Former Packers cornerback Bashaud Breeland is signing with the Chiefs, a source tells ESPN.com’s Rob Demovsky (on Twitter). It’s a one-year, incentive-laden deal that can be worth a max value of $5MM, according to Ian Rapoport of NFL.com (Twitter link). Last year, Breeland had a bizarre journey through free agency. He entered March as one of the top cornerbacks available and the Panthers pounced quickly to sign the Redskins free agent to a three-year, $24MM deal. Unfortunately, the Panthers 86’d that deal after they discovered an infection in Breeland’s foot resulting from an off-the-field injury. Towards the end of September, the Packers inked Breeland to a minimum salary deal. All in all, Breeland was on the field for just seven games (five starts), but he definitely made his presence known. 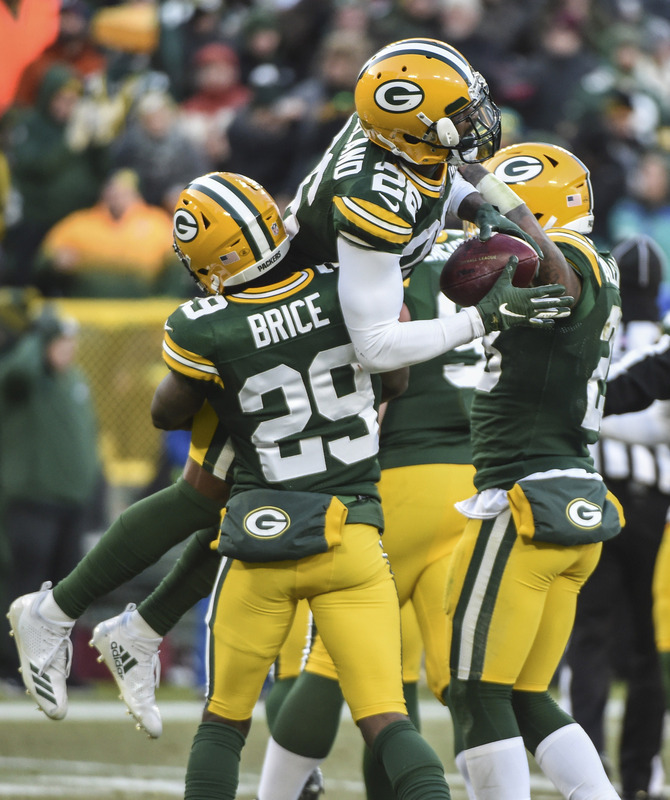 Breeland had two picks and a fumble recovery in his short GB run. Breeland should provide the Chiefs with additional firepower in the secondary after the release of Eric Berry. As it stands, Breeland projects to step into the starting lineup to replace Steven Nelson, who signed with the Steelers in free agency. The Chiefs flirted with Breeland last season before he joined up with the Packers and they got their man less than a year later. He also has an old friend in Kendall Fuller, his ex-teammate in Washington. A third Rob Gronkowski injury absence appears to be in the cards. The Patriots will not deploy their All-Pro tight end to play Sunday against the Titans, Ian Rapoport of NFL.com tweets. While Gronkowski is traveling with the team to Nashville, per ESPN.com’s Mike Reiss (on Twitter), he’s expected to be held out. Gronk missed games against the Bears and Packers but played in Buffalo on the Monday night in between those tilts. He’s been dealing with back and ankle trouble. While the Patriots have been able to win without their top pass-catcher, these repeated absences are obviously a concern for the future Hall of Famer’s availability for New England’s stretch run and potentially his post-2018 NFL future. It’s likely the Pats are attempting to rest Gronk now to hopefully see him healthy for key late-season games and the playoffs, but that can’t be considered a lock given his extensive injury history. Gronkowski hitting his incentive targets may now be unrealistic as well. Here’s the latest from the Week 10 injury front. Better news for the Bears. They’re in line to have both Khalil Mack and Allen Robinson back on Sunday when they face the Lions, per the Associated Press. Mack is no longer on the injury report after missing the past two Chicago games because of an ankle malady. His defensive player of the year chances took a hit because of this hiatus and Aaron Donald continuing another all-world season but Mack figures to still be in the running and can help a team attempting reach the playoffs for the first time in eight years. The Lions‘ Robinson coverage options will be limited. Darius Slay is out for Week 10, joining guard T.J. Lang in that regard. Slay’s played in each of Detroit’s previous eight games and hasn’t missed time since 2016 but is battling a knee injury. A neck ailment will sideline Lang, who also missed time because of a concussion this season. A tough injury night against the Patriots will have after-effects for the Packers. Kevin King will not play Sunday against the Dolphins because of a hamstring injury. Bashaud Breeland, whom ESPN.com’s Rob Demovsky notes appeared to impress the Packers in his Green Bay debut, figures to see more time. Both Sidney Jones and Jalen Mills are going to miss Sunday night’s Eagles-Cowboys game, but Corey Graham will return after missing four games, per Sirius XM Radio’s Adam Caplan (on Twitter). After claiming Cre’Von LeBlanc off waivers earlier this week, surely due to injuries affecting the aforementioned duo, the Eagles have seven corners on their roster. Taco Charlton and Connor Williams aren’t playing for the Cowboys on Sunday. Xavier Su’a-Filo appears to be the choice to replace Williams at left guard for Dallas, per executive VP Stephen Jones (Twitter link). A full-time Texans starter the past two seasons, Su’a-Filo has not played this season. Williams is down with a knee injury. 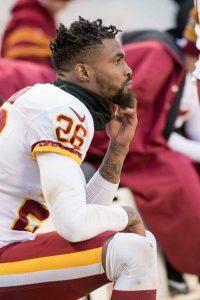 The Buccaneers met with free agent cornerback Bashaud Breeland this week, according to Adam Schefter of ESPN.com (Twitter link). Tampa Bay was torched by Drew Breees, Michael Thomas, and the rest of the Saints’ passing attack on Sunday, so the club is looking for all the help it can get. The Bucs, already short on cornerback talent with veteran Brent Grimes inactive, saw Vernon Hargreaves go down with injury in Week 1, leaving rookie Carlton Davis as the club’s top pass defender. Breeland, 26, hasn’t been wanting for interest this offseason, as he’s either met with or been linked to the Raiders, Ravens, Browns, Colts, Chiefs, and Jets. However, no club has yet to sign Breeland, and while injury issues are surely playing a part in most teams’ decision not to ink the veteran defensive back, the Ravens — for one — believe he’s asking for too much money. 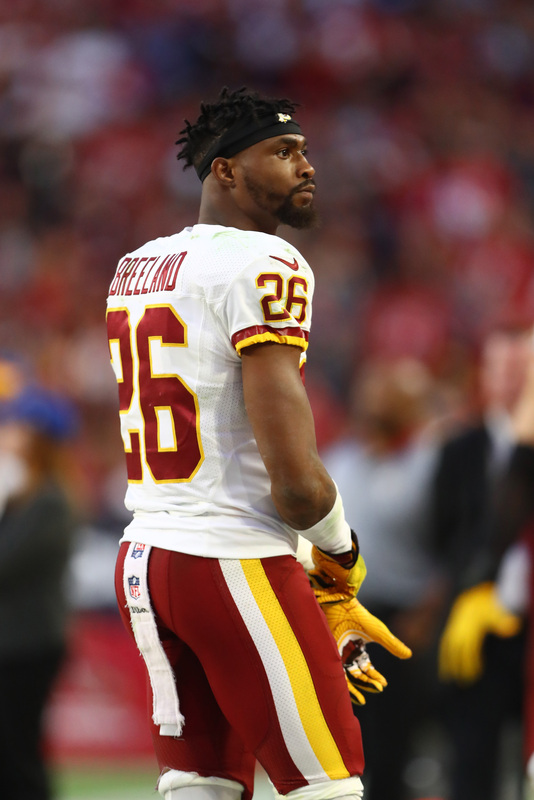 Breeland was originally a fourth-round Redskins pick in 2014 draft. A Clemson product, Breeland has been a starter from day one, totaling eight interceptions in 58 starts during his four-year career. Last season, Pro Football Focus ranked Breeland as the No. 50 cornerback among 121 qualifiers. Breeland, of course, agreed to a three-year, $24MM deal with the Panthers earlier this year, but that contract was voided after he failed a physical. A foot injury that was subsequently infected is reportedly the root cause of Breeland’s health question marks. The Dolphins are unlikely to sign free agent cornerback Bashaud Breeland after meeting with him last week, according to Armando Salguero of the Miami Herald. Miami is searching for a starting corner to play opposite Xavien Howard, but it doesn’t appear as though Breeland is healthy enough to play immediately, per Salguero. Breeland, of course, agreed to a three-year, $24MM deal with the Panthers earlier this year, but that contract was voided after he failed a physical. A foot injury that was subsequently infected is reportedly the root cause of Breeland’s health question marks. For now, the Dolphins are hoping one of Tony Lippett, Cordrea Tankersley, or Torry McTyer proves capable of playing alongside Howard as a starter. Aside from Breeland, other available corners include Adam Jones, Jeremy Lane, Dominique Rodgers-Cromartie, Kayvon Webster, and Orlando Scandrick.